Every year we have fun helping everyone make their stocking stuffers for family and friends on their Santa list. 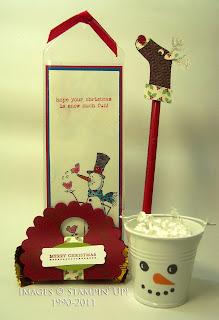 This year we have 4 projects to choose from: a bookmark, reindeer pencil, candy purse and snowman pail. You can pre-order kits in any amount you would like, so mix and match your projects to fit what you need. The cost for each kit is $1. At the class you'll make one of each project so you'll have a completed sample to take home. Then you'll take the rest of your kits home to assemble. You do have to pre-register for this class and let us know how many of each project you want to make so we can have them ready for you. We have a limited number of snowman pails, so if you want to make this project, please register early. Once the pails are gone, we won't be able to take any more orders for these kits. To register, please e-mail me at sharon@sharoncheng.com.